This beautiful property sits back deep in the woods and is secluded from the busy everyday life. When taking a trip to Lakeview Oasis, you will find serenity in the trees around you, and peacefulness of the view right out your bedroom window. This secluded three bedroom/two bathroom home is the PERFECT place to spend your next vacation! Just steps away from Greers Ferry Lake, you can not ask for a better location or a better place to spend your time. This beautiful three bedroom cabin sits right on the banks of the Little Red River and features a private boat dock. Sleeping 10 comfortably, you will not find a better place to enjoy a getaway to Heber Springs, Arkansas. This beautiful four bedroom home is located just minutes away from Old Highway 25 swimming site and campground. 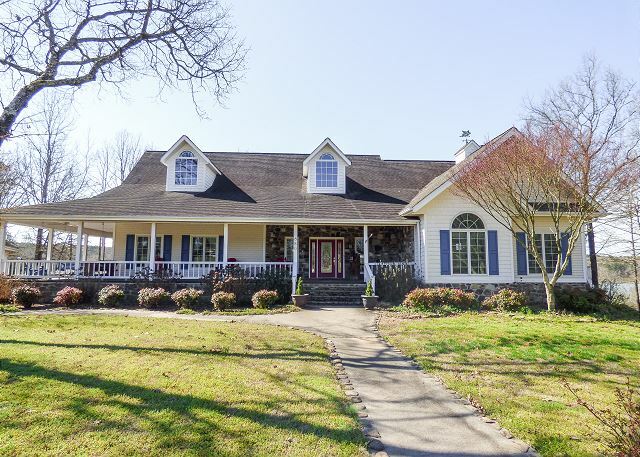 Sitting right on the banks of a bass stocked pond, this home is the perfect place to gather with family and friends. Escape to the lake at this waterfront vacation rental home in Edgemont, Arkansas! Located on the shores of one of the most pristine lakes in America, Greers Ferry Lake, this 5-bedroom, 3-bath home provides the ultimate retreat for large families or groups. Pack your bags and gather your friends for an epic Edgemont escape at ‘The Cownie Lodge,’ a 3,800 sq ft home that sleeps 18 guests with plenty of room to spare. With an unrivaled lakefront location, this property is one for the books! Escape to the lake at this waterfront vacation rental home in Edgemont, Arkansas! Located on the shores of one of the most pristine lakes in America, Greers Ferry Lake, this 4-bedroom, 3-bath home provides the ultimate retreat for large families or groups. La Dolce Vita, meaning "The Good Life" could not be a more accurate name for this three story home! Sitting right on Greers Ferry Lake & only a 3 minute drive to Tannenbaum Country Club, this is the perfect vacation destination for you and your family! This beautiful lakefront cabin is for the adventurous couple or family that is looking to get away from it all! Located at the end of a cove on Greers Ferry Lake, No Wake Zone is a gem found off the beaten path.